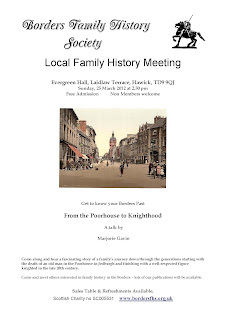 What, you might well ask, has Tweeddale Community Transport got to do with the Borders Family History Society ? 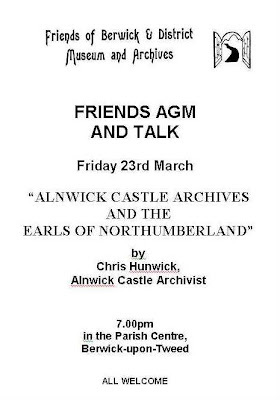 Well it's the reason that I've nearly finished transcribing the monumental inscriptions in West Linton Churchyard. One of our regular jobs is to collect a number of the older residents of the parish and take them to their Tuesday Afternoon Club. 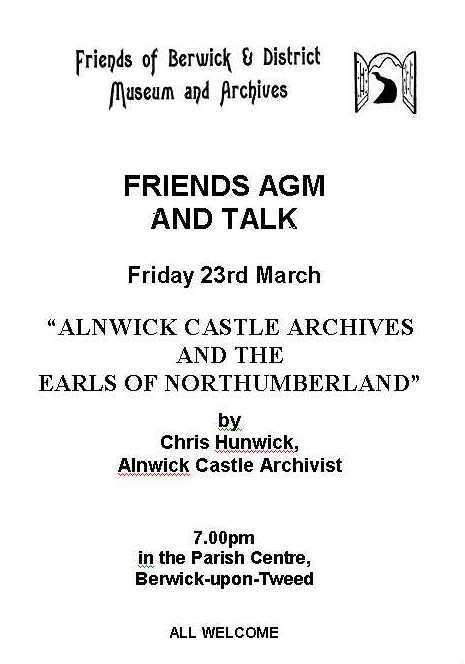 This involves a wait of around 1½ hours right beside West Linton Church. It occurred to me that this would be an ideal opportunity to make start on West Linton MIs. Almost 3 years on there are only about 15 stones left to complete. The most intractable ones of course. The Tuesday Afternoon Club doesn't meet in the summer but I hope I'll finish by the end of the year. 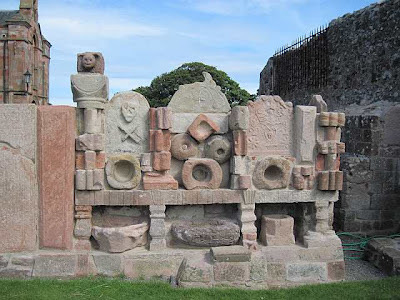 I've been helped a lot by West Linton and District History Association who surveyed the stones in the churchyard in 2003 as part of Historic Scotland's Carved Stone Decay project in 2003. Another chance from ArkivDigital, a Swedish provider of digital records, to get free access to Swedish records this weekend. Remember that Sweden is 1 hour ahead of GMT. I blogged about this ArkivDigital and my family history in Sweden last August. ArkivDigital now say they have close to 34 million color images in over 138 000 volumes online. You will need to register, download and install their software. I'm certainly going to try it out again. If you find this is useful to you, you may want to take advantage of their discounted membership offer at 995 Swedish Kroner (about £93) instead of 1195 Swedish Kroner (about £112). The offer is open until 1st April. Do let me know how you get on by clicking the 'comments' link below. Over the past few months, it's become more and more difficult for us to respond to members and the general public who have an AOL email address, for example, xyz123@aol.com or xyz123@aol.co.uk. That's because AOL seems to be blocking our replies to your emails or responses to messages sent using the form on our Contacts page, the Forum, or when registering for Surname Interests. No doubt, this is due to an over-zealous Spam filter on AOL's mail-servers. It's not a problem that we can do anything about, because we cannot communicate with AOL; emails from us are ignored or if we write from a bordersfhs.org.uk email address, are blocked. However, we think you can ensure that messages get to you, by adding our email addresses to your AOL address book/safe senders list. All email addresses are made up of a mailbox and a domain joined by an'@' sign. In the examples above the mailbox is xyz123 and the domain is aol.com or aol.co.uk. I don't want to put our email addresses on this blog, otherwise the nasty Spambots roaming the Internet looking for email addresses will collect ours, so you'll need to add the mailbox to the bordersfhs.org.uk domain with each of the mailboxes below from which you expect to get messages. Just in case that seems too difficult, we'll send an email to our members with the full email addresses. If you use Hotmail, or Earthlink, I think you may have problems similar to our members with AOL addresses, but as we don't get error messages to tell us that our email to you has been blocked, we can't be sure. Oh, if anyone from AOL, Hotmail, or Earthlink reads this and is willing to resolve this, we'll be happy to hear from them and be happier, if we could tell the world that the problem has been resolved. 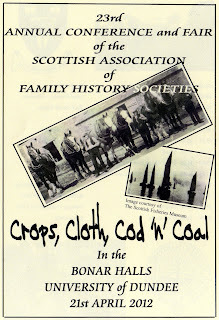 Conference will be held at the Bonar Halls in Dundee. 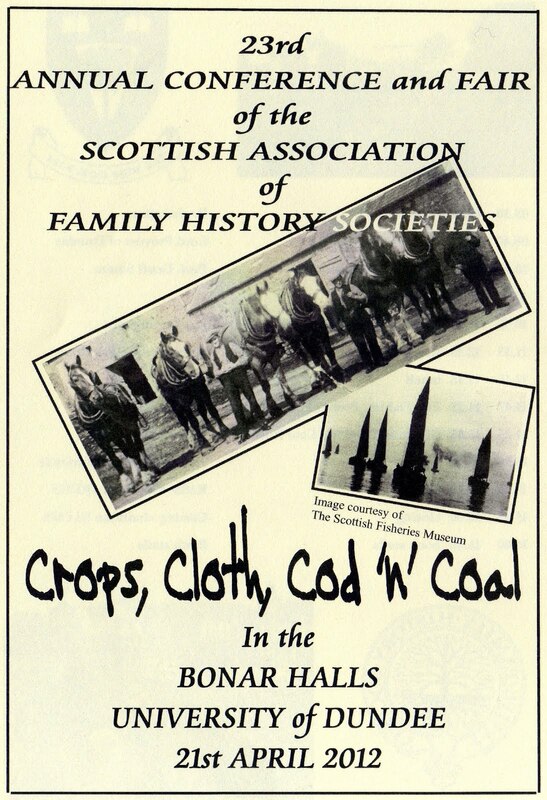 Talks will be on the Agriculture, Weaving, Fishing and Mining industries in Scotland. Borders FHS will be there among the many other FHS's, Archives and genealogy societies. My "must see" talks are Crops, as many of my family were Ag Labs and herds and the Cod talk, to learn more about the fishworkers and where they travelled to follow the fishing fleets. It's a great opportunity to see the best sources of information and to meet the experts. The conference will be hosted by Tay Valley FHS and Fife FHS. 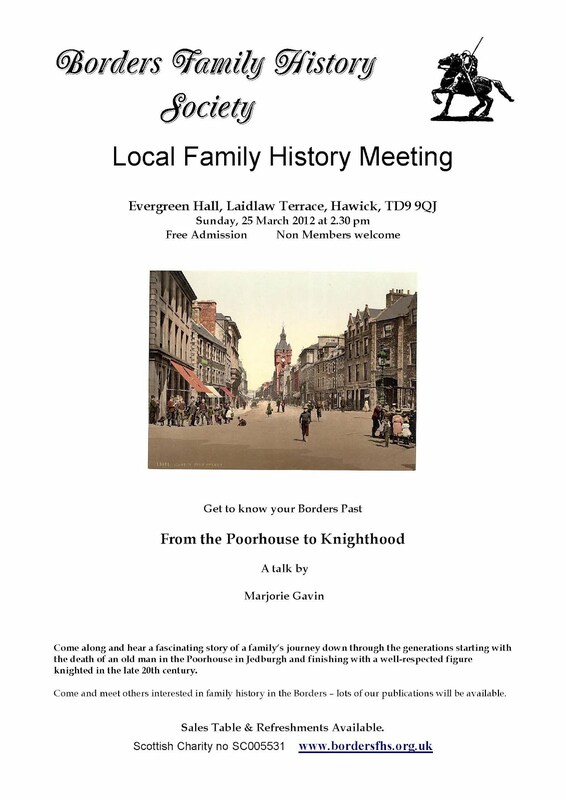 Have been delving into a booklet just published by Scottish Genealogy Society entitled “Edrom Parish - Certificates of Character - Given and Received” The given certificates cover the years 1797 to 1815 and those received, the years 1796 to 1854. On moving, whether because of family reasons, employment or otherwise it was necessary before being admitted into the Church in the new parish to produce a certificate of good character signed by the minister of the Church from which one was moving. The certificates issued give the date, the name of the person, the minister who issued the certificate and the parish whence they came. 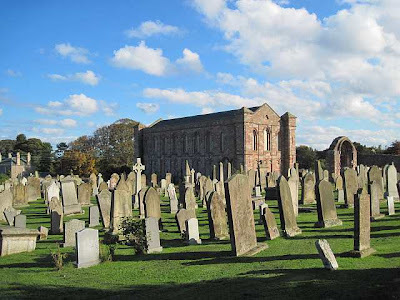 Most of those were fairly local but there were a number from further afield and I noticed for instance new communicants to Edrom coming from such places as Strichen, Largo, Mauchline and also from Yorkshire. What I found of particular interest was a record of new certificates issued to persons taking communion for the first time, invariably members of families already resident in the Parish. These records show the farm of residence and are in many ways ‘coming of age‘ certificates and it is interesting to trace members of the same family as they ‘reach maturity’. The gravestones at Edrom were transcribed by the Society last summer and we are hoping to be able to publish reasonably shortly. One of the ministers who issued (and received) certificates was the Rev. John Hastie (1797 to 1822). The Rev Hastie left a diary which was published by the Society in 2004 and is still available to purchase (price £6.50) As well as giving much background information on the day to day life of a Parish minister at this time there is also in the diary a considerable amount of genealogy not contained in the Parish records. 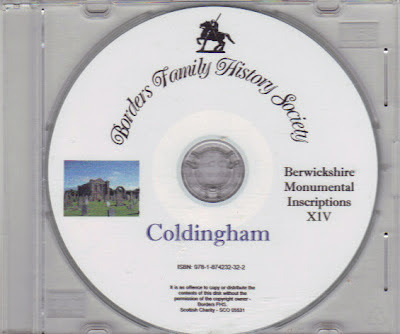 The booklet, a copy of which is available for consultation within the Society Archive, can be purchased from the Scottish Genealogy Society at a price of £3.50 plus postage. 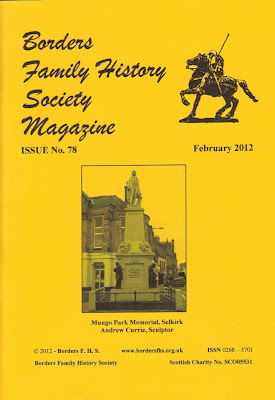 The latest issue of our 44 page Borders Family History Society magazine was posted to members on 27th and 28th February. Although the first issue of the calendar year was previously in March, the editor has decided that February is more suitable. 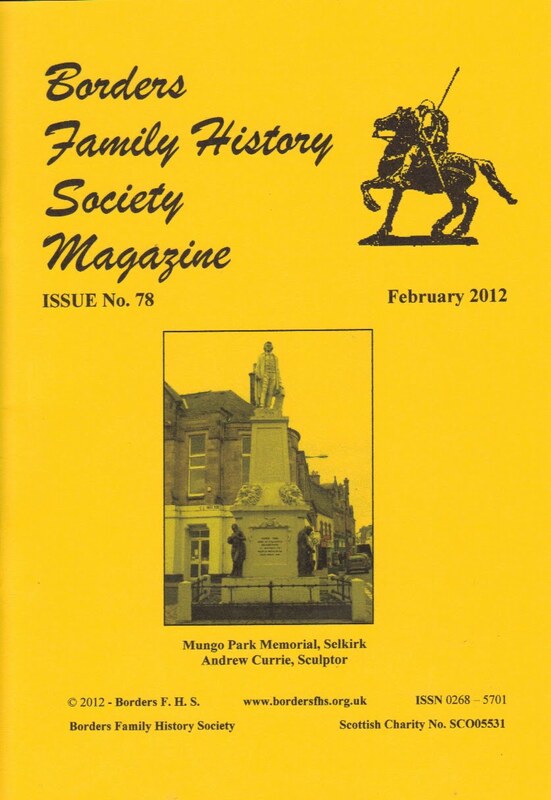 an intriguing story titled "What might have been"
The cover shows the Mungo Park Memorial at Selkirk.